FOR twelve years, a loyal band of Rosies volunteers has buzzed around the Beenleigh area distributing hot meals to the hungry. 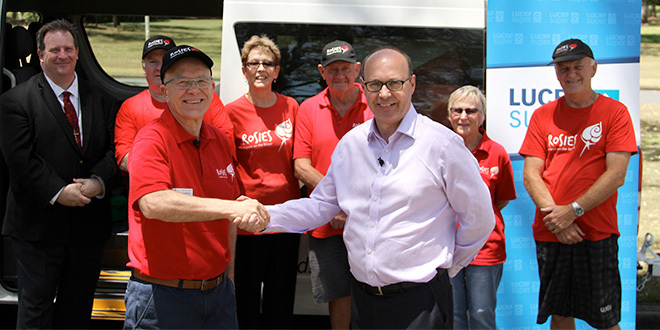 Last week, they were rewarded for their hard work, when a superannuation fund gifted them a van and barbecue trailer. The benevolent bequest, which came from LUCRF Super Community Program, will transport up to 10 volunteers, ensuring the needs of the area’s most vulnerable members will continue to be met. Rosies general manager Andrew O’Brien said the timing of the donation was ideal. “We had a plan to upgrade all our vans across our branches,” Deacon O’Brien said. “(LUCRF Super’s Community Program) came along and said ‘we’ve got some funding if you have a need’. Giving back to the community is something that the superannuation fund’s chief executive officer believes is of importance to its members. “We run a community program that’s very diverse,” LUCRF Super chief executive officer Charlie Donnelly said. “Although our head office is in Melbourne, we love running programs all over Australia to help people in the communities where our members live. Rosies vans have been driving Queensland roads for more than 20 years. Deacon O’Brien said the donation of the van would provide the basic infrastructure necessary to enable volunteer engagement and hospitality for up to 80 patrons per outreach. “Our vans enable us to have a visible presence,” he said. Rosies vans have an average lifespan of 12-15 years. The oldest van, bought in 1996, will retire in 2019, aged 22.